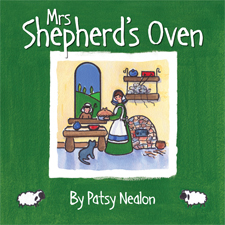 Mrs Shepherd has pies to bake for her knitting group. She is not happy because her brick oven has fallen down. What will she do? The quirky and fun adventures of a family of shepherds whose story touches on, and coincides with, the Christmas story. Great reading for all year round, and for general (as well as Christian) audiences. Illustrated throughout with water colour cartoon pictures that kids will love. Softcover, 22 pages full colour. For ages 4 - 9.